Mary from Florida has created these fantastic celebration guest towels made out of our line of white hemstitched linen hand towels! Mary is a machine and hand embroiderist and likes to create (design and digitize) linen hand towels to commemorate special events. 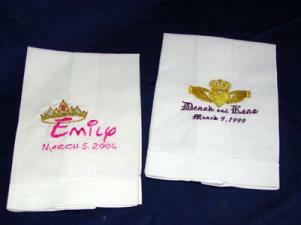 These two hand towels pictured on the left were created for her granddaughter's birthday and the other was for her son's wedding anniversary. What excellent and meaningful gifts! Buy linen guest towels now! Choose from a wide variety of linen towels at excellent prices.